Game in the Swan Centre yesterday on another 'record footfall' day. Another retailer in the Eastleigh flag ship swan centre is reported to be struggling. 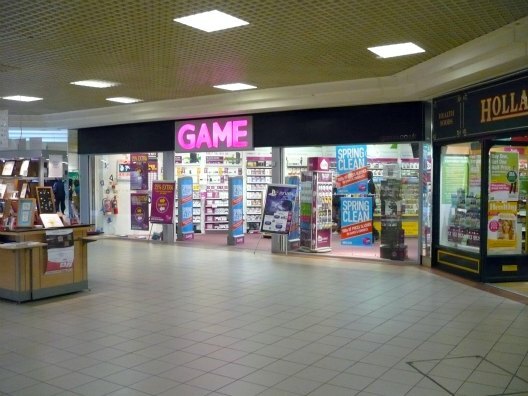 Game, part of a 600 strong chain of video game stores that employ an average of 10 staff per store – have announced suppliers are refusing them stock amid concerns over the groups credit worthiness. The company is locked in negotiations with suppliers and lenders – understood to include tax-payer owned RBS bank -but it is believed administration is a real possibility. Recently the Peacock clothing stores went into administration although the Eastleigh branch was bought out by Edinburgh Woollen Mill and will continue to trade. A recent trend has been for buyers for distressed business to come forward only after the take-over target had gone into administration to avoid shareholder and pension obligations. Gaming websites were advising people who had points on Loyalty cards and gifts vouchers to redeem them as soon as they could. If Games go bust it will be the biggest store failure since Woolworths. Eastleigh’s branch of Game in the Swan Centre is close to empty units previously occupied by failed businesses Adams kids clothing store and Priceless shoes – who went bust in January. Meanwhile home and garden wares retailer Robert Dyas – who have a large unit in the Swan Centre -have recently closed stores in Southampton and Bournemouth after announcing they would be concentrating on stores in the greater London area. Last month my Daughter wanted the new Super Mario 3DS game for her birthday. I popped into Game and it was £39…Asda had it for £28. Game even wanted £30 for a second hand copy! So I went to Asda and parked for FREE. I can’t imagine too many gamers wanting to drive to Eastleigh, paying to park then paying over the odds for their games. Amazon even offer this game for £29 with free postage. Wait til the Sainsbury’s megastore opens – lets open a book on what will be left in the Swan Centre. If Sainsbury’s gets permission to build a mega-store, it will have exactly the same effect that the Swan Centre had on Eastleigh, i.e. it will “split the town”, or what’s left of it (only much worse)! UNLESS the Council is bold enough to revitalize the Swan Centre end starting right now! That means opening up the giro system of Market Street, Factory Road, High Street and Leigh Road. Free on street parking is essential for the first 30 minutes and a nominal rate thereafter up to a 2 hour maximum. Scrap the dreadful awnings and widen the road. Get the cars back into the heart of the town. That is the ONLY thing which could draw back sufficient trade to that part of the town and prevent the ultimate economic disaster for Eastleigh. If Sainsbury’s opens a mega-store, existing shops must be helped to fight a price war. The current parking charges are a destructive way to gain revenue. I understand the reasons for them, but believe they are damaging trade. Parking charges deter shoppers, it’s that simple. Make it convenient for motorists again and let the small shops offer what the mega-store never could and with luck, Eastleigh will revitalize. Game have been struggling nationally for a while now, so it comes as no surprise. Good point about getting cheaper games at ASDA etc. The advent of the new Sainsburys will, unless the council act swiftly, be the death knell of what was once, a reasonable shopping centre. (from a male point of view). The restrictions put in place through on street car parking has I know stopped people I know, just ‘nipping into town’ quickly for that quick purchase. The advent of mini marts at petrol stations doesnt help either. Offerring incentives to prospective traders such as rent reductions, business rate holidays / reductions, can all be achieved at a local level if the will was there. The Inland Revenue via legislation could offer tax breaks / incentives / tax holidays… to encourage new businesses to open and flourish. Lets not forget that the banks also have a role to play in helping new business. At this time, they are still not helping small / med business development and growth. Eastleigh town centre is looking tired. Its a shame that the council didnt spend the Rosebowl bailout money on the town centre instead of a hotel. But then again, what do you expect! If planned 5.6% increase in business rates goes through then I think we can expect a few more empty shopfronts in the town.